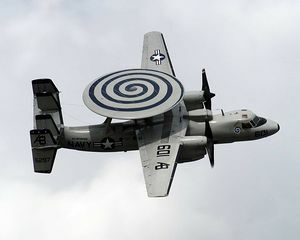 E-2 Hawkeye airborne early warning (AEW)aircraft were designed for the U.S. Navy to carry a powerful search radar, both for the advantages of the greater horizon of an airborne radar, and also to let its aircraft carrier minimize its electronic emissions. E-2C in flight; the antenna is painted with the insignia of Squadron VAW-123, the "Screwtops"
As opposed to naval helicopters that only carry a radar but no battle staff, the Hawkeye, with five crew seats, does have a limited airborne warning and control capability, but normally uses a low probability of intercept data link to its carrier group. Typically, its signals will be processed both on the carrier and on a Ticonderoga-class cruiser where the group anti-air warfare officer may be based. While it cannot carry the large battle staff aboard a land-based E-3 Sentry, it does have a mission staff of three: combat information center officer, air control officer and radar operator. For missions of moderate size, the onboard staff can conduct missions such as "surface surveillance coordination, air interdiction, offensive and defensive counter air control, close air support coordination, time critical strike coordination, search and rescue airborne coordination and communications relay." The Hawkeye, the E-2C, became operational in 1973, and surpassed one million flight hours in August 2004. There is a constant upgrade program, with the most recent being the Hawkeye 2000 Group II Plus; a E-2D version is planned. Its current main radar is the AN/APS-145, made by Lockheed Martin and, in conjunction with the AN/UYQ-70 computer and display, the aircraft can track in excess of 2,000 targets, at ranges greater than 550km, and control intercepts on 40 hostile targets. One radar sweep covers six million cubic miles. The latest operational version, Hawkeye 2000, has upgraded computing using commercial off the shelf technology, including improved AN/APX-100 identification-friend-or-foe (IFF), global positioning system (GPS) and the Carrier Aircraft Inertial Navigational System (CAINS) II navigation system. Enhancements to its link with the Cooperative Engagement Capability (CEC), an extension of the AEGIS battle management system, extend its capability as part of future sea based Theater Ballistic Missile Defense (TBMD). Communications on the Group II Hawkeye 2000 upgrade include the Joint Tactical Information Distribution System (JTIDS) with three-channel Link-16 plus the earlier Link-4 and Link-11 datalinks. The Group II upgrades brought the complement of radios on board the Hawkeye up to two HF, three VHF-UHF, and two UHF systems to support voice and datalink communications: triple-channel AN/ARC-158 UHF data link, an AN/ARQ-34 HF data link. A AN/ARC-210 SATCOM adds Time Division Multiple Access (TDMA) and non-TDMA Wide-Band Secure Voice (WBSV), Narrow-Band Secure Voice, Officer-in-Tactical Command Information Exchange Subsystem-II and Tactical Display Indicator (TDI) capability (with WBSV limited to non-TDMA).. In addition, the Multimission Advanced Tactical Terminal (MATT) provides the Hawkeye access to the Tactical Receive Applications (TRAP), Tactical Data Information Exchange System Broadcast (TADIXS-B), and Tactical Information Broadcast Service (TIBS). The MATT has integral encryption. Engines and propellers have been upgrade, and the E-2 is now able to be air refueled It also has an AN/ASN-50 heading and attitude reference system, an AN/ASW-25B automatic carrier landing system and a Honeywell AN/APN-171(V) radar altimeter. As well as the U.S. Navy, it is in current service with Egypt, France, Japan,Mexico, Singapore and Taiwan. Israel has used it in the past, but now uses its Phalcon electronics, in both airliner and business jet airframes; Mexico uses former Israeli aircraft. According to the Navy, the AHE mission will be to provide advance warning of approaching enemy surface units, cruise missiles and aircraft, to vector interceptors or strike aircraft to attack, and to provide area surveillance, intercept, communications relay, search and rescue and strike and air traffic control. Primary Function: Airborne Command & Control, Battle Space Management. Contractor: Northrop Grumman Aerospace Corp. Propulsion: Two Allison T-56-A427 turboprop engines; (5,100 shaft horsepower each). Weight: Max. gross, take-off: 53,000 lbs (23,850 kg) 40,200 lbs basic (18,090 kg). Airspeed: 300+ knots (345 miles, 552 km. per hour). Ceiling: 30,000 feet (9,100 meters). This page was last modified 08:27, 14 October 2013.